Infrared photography isn't just for soldiers or police, it also gives photographers a tool for capturing what is normally unseen. A strong case in point is photographer, artist and Tron title designer GMUNK, aka Bradley G. Munkowitz. 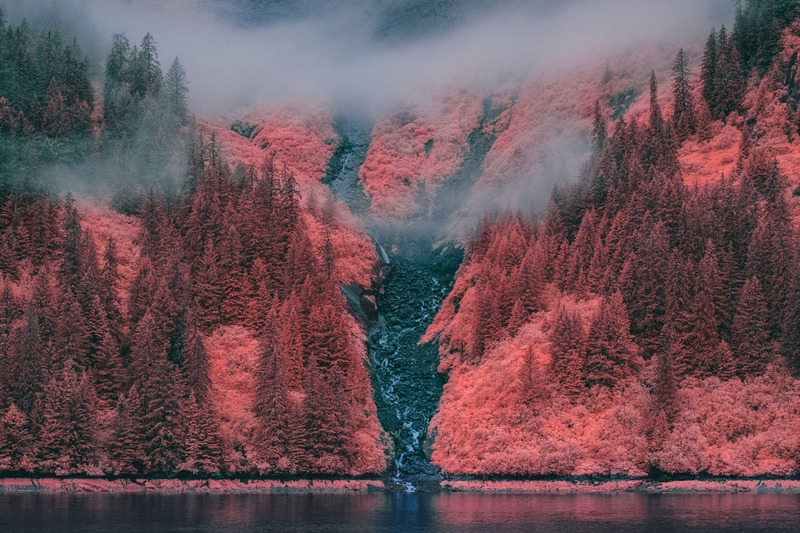 He trekked to Alaska's Tracy Arm Fjord last summer with a modified Fujifilm X-T1 IR full-spectrum camera in hand, transforming the already-dramatic landscape into a psychedelic exoplanet. 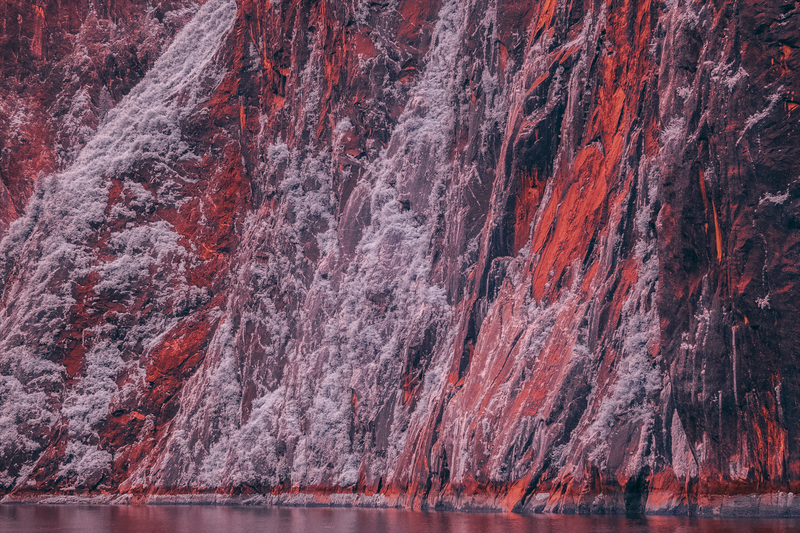 "InfraMunk vs Tracy Arm Fjord" was shot from a small boat that plied the 30-mile-long, ice-covered inlet on Alaska's west coast, adjacent to northern British Columbia. His X-T1 IR's infrared capability was further enhanced with LifePixel "Super-Color" Infrared filters and vintage, manual-focus Nikon lenses. The results, he said were "some fiercely psychedelic and experimental palettes that portrayed the scenery in an entirely new light." Because foliage reflects infrared light much like snow reflects visible light, trees, grass and plants tend to turn a white or pink color. At the same time, the spectrum can cut through haze and turn water a profoundly dark hue, yielding ghostly, extrawordly scenes. One of the most famous purveyors of the craft, Richard Mosse, won the Deutsche Börse 2014 prize for his infrared series on the horrific war in Eastern Congo, shot on military-grade infrared film. "Infrared light is reflected off the chlorophyll in healthy green ... [helping the military] identify the enemy hidden in the landscape," he said in a Frieze documentary. 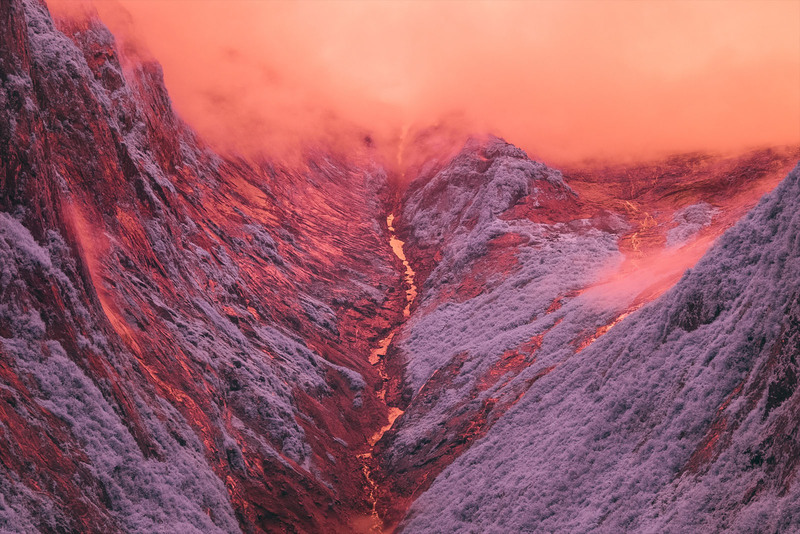 The strange, disorienting beauty of infrared, he says, gets viewers to "think about the act of perception and how this imagery is produced and consumed." You could say the same thing about GMUNK's Tracy Arm Fjord landscapes. We're inured to rugged landscapes rendered in the visible spectrum, so his infrared images force us to look at them in another way. Depending on how the photos are treated, they can make angular cliff faces look even more unforgiving, or turn a forest scene into a fluffy dreamscape (the entire series and prints are available here). Though mostly used for landscape photography, IR "turns skin tones milky smooth and can see through sunglasses," Pixsy notes. If you're thinking of trying it out, it says you'll need to experiment a lot so you can spot scenes that work well in IR. "Since you are photographing a light spectrum that you can't see, check the LCD often."